9-1 What general principles are useful in determining whether a lesion lies at the level of the cerebral cortex, internal capsule, cerebellum,basal ganglia, brain stem, spinal cord or peripheral nerve? Ans. Cerebellar and basal ganglia lesions result in motor problems, specifically in aberrations in the quality of coordinated movements, as opposed to paralysis. Cerebellar dysfunction is characterized by awkwardness of intentional movements. Basal ganglia disorders are more characterized by meaningless, unintentional, unexpected movements. Fig. 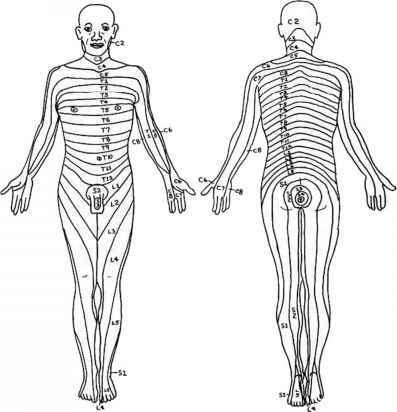 53 Dermatome map of Che human body. C, cervical; T, thoracic; L, lumbar; S, sacral. Lesions in the cerebral cortex and internal capsule both result in sensory and motor defects confined to the contralateral environment. It may be difficult to differentiate a lesion in the cerebral cortex from one in the internal capsule. The presence of higher level dysfunction, particularly an agnosia or apraxia, is more consistent with a cerebral cortex lesion. Unilateral brain stem and spinal cord lesions result in ipsilateral as well as contralateral defects, owing to the crossing over of certain pathways and not others. In the spinal cord, a unilateral lesion results in ipsilateral paralysis and proprioceptive loss and contralateral pain-temperature loss below the level of the lesion. A unilateral brain stem lesion results in contralateral upper motor neuron paralysis and in contralateral proprioceptive and pain-temperature loss below the head, and in ipsilateral cranial nerve defects. The presence of cranial nerve involvement signifies that the lesion lies above the level of the foramen magnum. The presence of radicular pain along an extremity suggest that the lesion lies below the level of the foramen magnum, but it should be noted that such pain may be incidental to more peripheral problems. The presence of a cranial nerve defect on one side and defects of motor or sensory modalities in the contralateral extremities confirms that the lesion lies at the level of the brain stem and not in the cerebral cortex or internal capsule. Peripheral nerve injuries result in ipsilateral motor and sensory defects. Peripheral nerve lesions may be distinguished from internal capsule and cerebral cortical lesions by the presence of lower motor neuron signs (see pg. 23) and motor and sensory defects along a derma-tome-like distribution (Figure 53). In distinguishing a spinal nerve root lesion from a more peripheral nerve lesion, several points should be considered. Severing a single spinal nerve root commonly results in little if any motor or sensoty defect owing to the overlap distribution of adjacent roots. It may be necessary to sever three or more roots to cause a significant motor or sensory defect. With certain exceptions the dermatome (skin) map of the various spinal nerve roots approximately overlies the muscular map distribution of the same spinal cord segments. 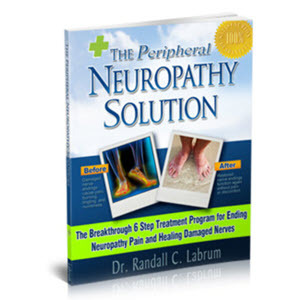 Spinal nerve root lesions result in deficits that differ from those that follow lesions of peripheral nerve plexuses and more peripheral extensions of the nerve. This is a consequence of the fact that a peripheral nerve is a mixture of fibers arising from several nerve roots. 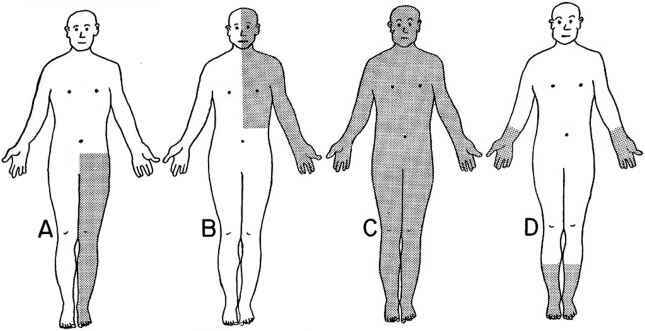 Figures 54 and 55 illustrate the characteristic motor and sensory deficits that arise from classical peripheral nerve lesions. 9-2 Localize the lesions in Figures 56-61 (shaded areas indicate regions of functional deficit). Elbow and wrist extension (patient has wrist drop); extension of fingers at metacarpophalangeal joints; triceps reflex. Wrist, thumb, index, and middle finger flexion; thumb opposition, forearm pronation; ability of wrist to bend toward the radial (thumb) side, atrophy of thenar eminence (ball of thumb). Flexion of wrist, ring and small finger (claw hand); opposition little finger, ability of wrist to bend toward ulnar (small finger) side; adduction and abduction of fingers; atrophy of hypothenar eminence in palm (at base of ring and small fingers). Elbow flexion (biceps); forearm supination; biceps reflex. Ability to move upper arm outward, forward, or backward (deltoid atrophy). Ability to elevate arm above horizontal (patient has winging of scapula). Knee extension; hip flexion; knee jerk. Hip adduction (patient's leg swings outward when walking). Knee flexion plus other functions along its branches—the tibial and common peroneal nerves. Foot inversion; ankle plantar flexion; ankle jerk. Foot eversion; ankle and toes dorsiflexion (patient has high slapping gait owing to foot drop). This nerve is very commonly injured. 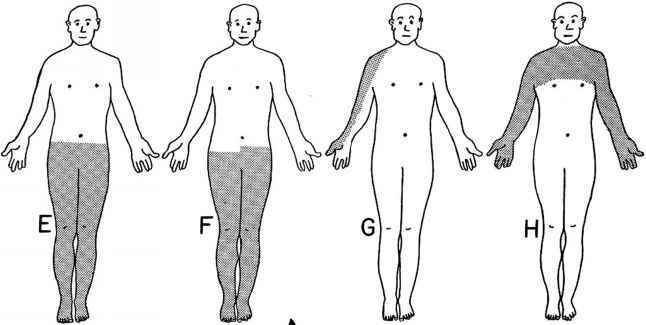 Figure 55 Sensory defects following peripheral nerve injuries. A. Right anterior cerebral artery (see Figs. 7, 8). B. Right middle cerebral artery (see Figs. 7, 8). C. Amyotrophic lateral sclerosis (see Fig. 18A). Distal extremities commonly affected first. 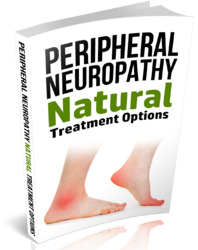 D. Peripheral neuropathy (see question 3-5B). E. Tertiary syphilis (tabes dorsalis). Upper extremities less commonly affected (see Fig. 18B). F. Hemisection of spinal cord (Brown-Sequard Syndrome) on left at Til (see Fig. 15 and question 3-1). G. Radicular pain, cervical roots C5-C6. H. Syringomyelia C5-T2 (see Fig. 18F and question 3-3). Cervical levels are most commonly affected, often with atrophy of the small muscles of the hand. I. Total transection of spinal cord, T11. The deficit could also result from a midline tumor at the level of the central sulcus, but the deficit in the latter would probably be less dense than that following a spinal cord transection. J. Pernicious anemia. Commonly also presents with numbness and tingling of the distal portion of all extremities secondary to peripheral nerve inyolvement (see Fig. 18C). K. Guillain-Barre syndrome. 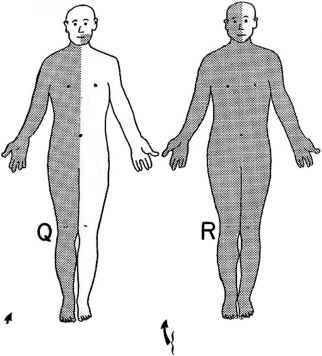 Commonly ascends to upper extremities and face after affecting lower extremities (see Fig. 18E). N. Median nerve compromise. 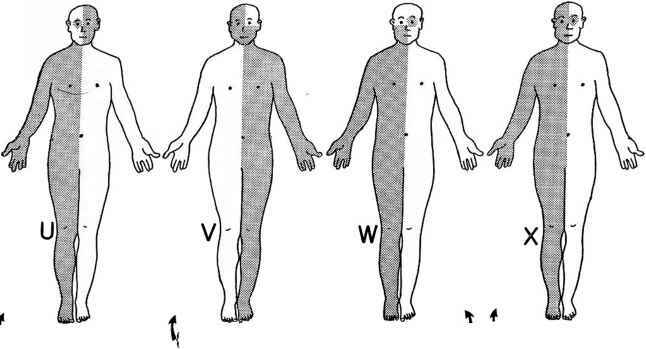 When injury is at level of wrist (e.g. carpal tunnel syndrome), wrist flexion is unaffected. 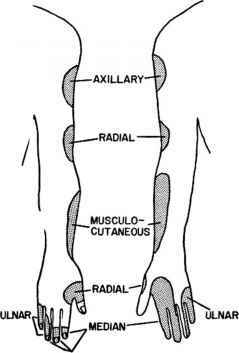 P. Cauda equina lesion, S2-S4. Q. Lesion of left medulla (see question 5-3B). R. Syndrome of the posterior inferior cerebellar artery (see question 5-3C). May also cause contralateral loss of facial pain-temp, if trigeminal lemniscus involved (see pg. 41 and Fig. 27). S. Lesion of the right caudal pons (see question 5-3F). 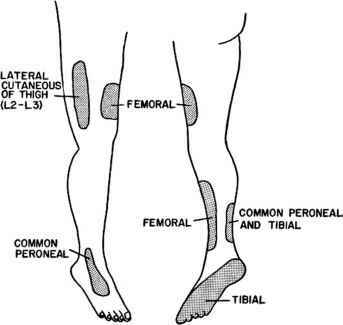 T. Common peroneal nerve injury. U. Multiple sclerosis (no single lesion possible). V. Lesion of right pons (see question 5-3H). W. Lesion of left midbrain (see question 5-31). X. Lesion of left midbrain (see question 5-3 J).